Photos from Ads of the World. The rule of thumb when designing a billboard is minimalism: keep it short and simple so that your message is absorbed by anyone, even people casting the most fleeting glance. 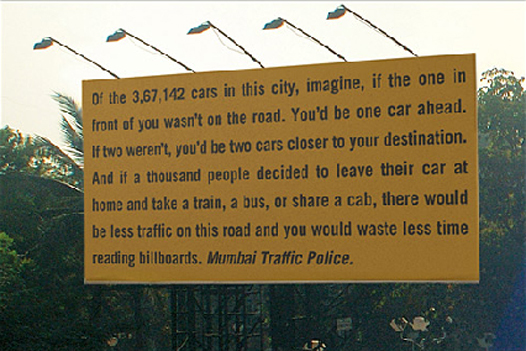 So why does this billboard in Mumbai have so much text? Traffic. The traffic moves so slowly here that the industry standard doesn’t apply. 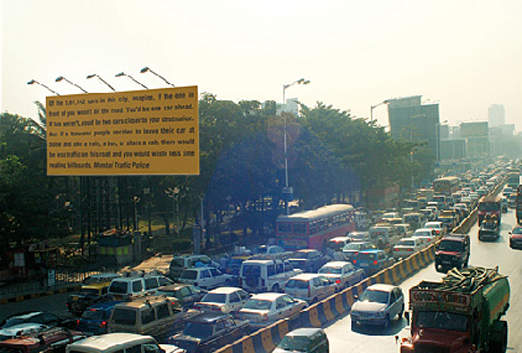 As these billboards suggest, the police are starting to take congestion and the resulting air pollution seriously. This makes sense since its the traffic police that have to stand in traffic all day and breath in exhaust. In Calcutta, many police stations are already being outfitted with oxygen devices so that police officers can breath easier after having been on the streets all day. 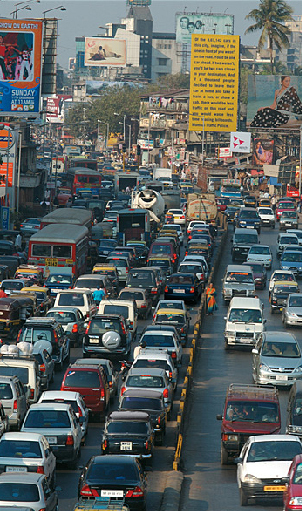 It’s time the traffic police, alongside all other City stakeholders start developing projects to improve public transportation and develop programs to promote transportation demand management. While this happens, we, as individuals, can leave our cars at home by participating in groups like like CAR FREE DAY in BANDRA.